Some people who hate fun say it's time for everyone to stop fawning over retro liveries. Maybe that's true. But when a legendary race car like the Ford GT is reborn for 2015, it's only natural to wonder what it would look like in classic Gulf Oil colors. Wonder no more! Stop Fawning Over Retro Liveries. It&apos;s Time For Something New. 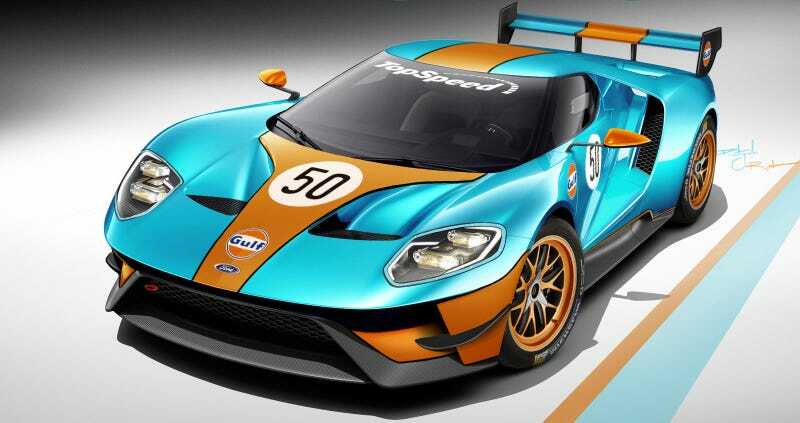 Just as our friends at Road & Track did recently, the folks at TopSpeed created a mockup of the new GT in legendary blue and orange Gulf colors. They imagined it as an LM GTE class racecar in the World Endurance Championship, where we think it has a good shot at actually racing. As a GTE class racer, the GT would also receive extensive body modifications, but the American supercar will remain highly recognizable in racing apparel. Changes will begin up front, where the GT will gain a reworked apron with a new splitter and side canards for improved downforce and aerodynamics. A pair of modified fenders that include louvered areas atop the wheels are also likely, but it all depends on wind tunnel testing. On the sides, transformations will include new mirrors, wider side skirts, reshaped intakes and ultra-lightweight wheels wrapped in slick tires. Ford will also focus on getting the GT as close to the track as possible. Looks awesome. I think we'll see this car on track eventually; I'd love to see it in these colors, too. Check out more over at TopSpeed.